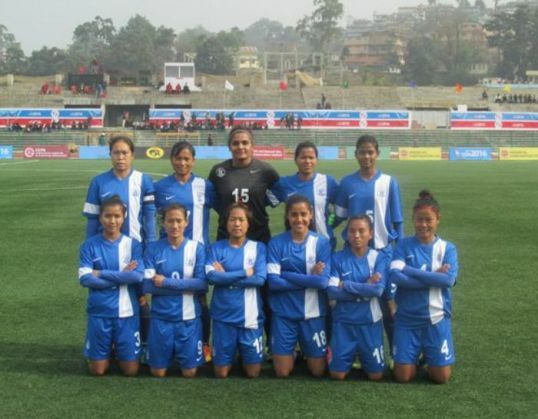 The Indian women's football team pipped Sri Lanka by five goals to nil in their second game at the South Asian Games in Shillong on Tuesday, 9 February, to move one step closer to a berth in the final. India, who had won the gold medal in the previous edition of the Games in 2010, had been held to a frustrating goalless draw in the opening game against Maldives. The Indian side was more clinical on Tuesday, and managed to put the ball past the Sri Lankan keeper on five occasions. Dangmei Grace scored a brace, while Kamala Devi and Sasmita Mallik too got on the scoresheet, as the visitors failed to put up a fight at the city's Jawaharlal Nehru Stadium. An own goal from a Sri Lankan defender added to the misery of the islanders. India now have four points from their two games, and will be up against Bangladesh and Nepal in their two remaining games in the competition.